Saint Pierre & Miquelon, a group of French Islands in the North Atlantic Ocean just South of the Canadian province of Newfoundland and Labrador has a total land area of 93.4 square miles and a population of over 7,000. A strait ravaged by fierce storms separates the islands. Fishing, the only sector of the economy for the longest time went into overdrive resulting in a ban. The government is putting effort into making tourism, agriculture, fish farming and crab fishing represent the economy. August and September are the best time to visit this island. Beautiful churches, lighthouses, other sites of historical and cultural importance, and numerous hiking/biking trails along with a variety of feathered friends entertain the tourists. Wild horses, seals, whales and other marine life can also be observed here. The cuisine is distinctly French with the French Air Force flying in their requirements in cheese, wine, lettuce and endives. French wines are definitely the best souvenir from these islands. The first stamps of St. Pierre & Miquelon were a set of three stamps released in 1885 that were Handstamp Surcharge on Stamps of French Colonies. The set (Scott #1 to #3) catalogs for around $145 mint and around $85 used. Another set of four handstamp surcharges followed in 1885. That set (Scott #4 to #8) catalogs for around $13K mint and around $4K used. The #7 is extremely rare and accounts for most of the value of the set. The handstamp surcharge overprints continued until 1891 when they were replaced by Stamps of French Colonies with ‘St. Pierre’ overprints. Those stamps are also very valuable cataloging from the few 10s to a few 100s of dollars range individually. St. Pierre & Miquelon released a long set of nineteen stamps between 1892 and 1908 which were key types of the ubiquitous Navigation and Commerce theme. The set (Scott #60 to #78) catalogs for around $300 mint and around $210 used. 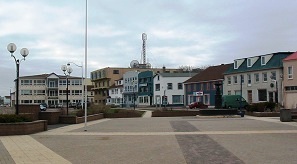 St. Pierre and Miquelon came under the French in 1814. It became an overseas territory in 1946 and currently it is an overseas collectivity of France. St. Pierre & Miquelon released a long set of thirty two stamps between 1909 and 1930 in the Fishing Industry theme. The set (Scott #79 to #109) catalogs for around $100 mint and around $90 used. The designs show fisherman, fulmar petrel, and fishing schooner. The Island depended on cod fishery for the last four centuries. The Grand Banks of Newfoundland, a group of underwater plateaus Southeast of Newfoundland was one of the richest fishing grounds in the world. Canada has imposed a long-term closure of this industry due to overfishing. Currently, efforts are underway to develop tourism and fish farming to diversify the economy. A long set of twenty stamps released in 1941 that were ‘Noel 1941 France Libre F.N.F.L’ overprints on stamps issued between 1938 and 1940. Genuine copies of the set are rare and valuable cataloging in the $2K range for mint or used. Excellent counterfeits are known to exist. Several other overprints were also issued and genuine copies of them are valuable. Remainders were sold at a premium by the Free French Agency of Canada. A set of four stamps released in 1970 showing domestic animals. The set (Scott #404 to #407) catalogs for around $60 MNH and around $20 used. The designs show ewe and lamb, animal quarantine station, Charolais bull, and refrigeration ship slaughterhouse. A set of eight stamps released on April 17, 1991 showing Scenic Views. The set (Scott #561 to #568) catalogs for around $8 MNH and a little less for used. The set is also available as two strips of fours and that has similar valuation. The designs show Saint Pierre, Lle Aux Marins, Langlade, and Miquelon. The first coins of St. Pierre & Miquelon were French Territory Standard Coinage (100 Centimes = 1 Franc) Aluminum Francs issued in 1948. Pieforts and Essais were also released in the same year. No coins have since been issued and the local people use both French and Canadian currency for trade. Miscellaneous Collectibles $3 and up Vintage Postcards start around $2. Ship Souvenir Collector Spoons start around $10.